Today is Sunday. I am sure you have many plans for the day even I have also. 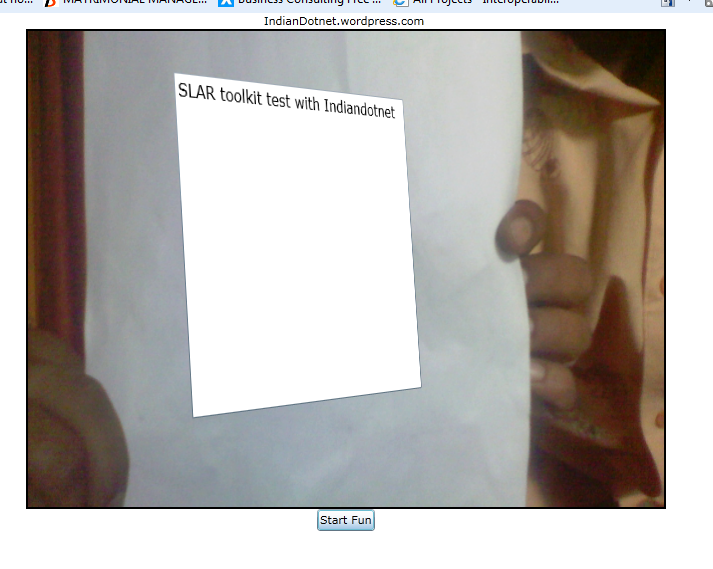 My plan is to share one awesome feature of Silverlight which is Augment Reality. I am very excited for this. A new toolkit is introduced which is SLAR toolkit. The Silverlight Augment reality by the name it is clear that it’s more about reality work. The current sample project we match pattern of an image. We just move the corresponding images in front of our web cam and if the pattern matches we put some kind of marker like text box, images. Is it interesting? , Really it is when you tried it you will enjoy the functionality more. I tried this toolkit and I am very much impressed with this new utility. With this utility you can try various feature programs, games and make the things more interesting more live. I am going to show you an existing sample to you which is mainly for recognizing the pattern images. Although I am not going to do something extra it’s exactly same which is provided by SLAR Toolkit. 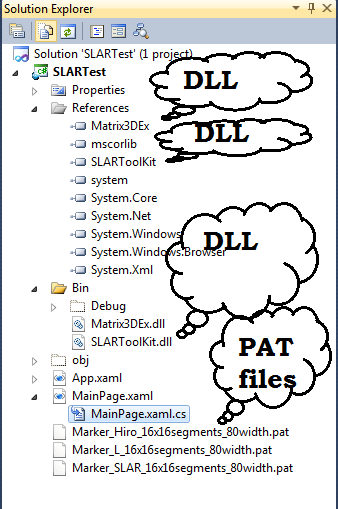 2) Copy Matrix3DEx.dll, SLARToolkit.dll in bin folder of the project and add reference of the DLL in the project. 4) The structure of the project now looks like as below. Now when you will run the code you are surprised by the working functionality of the page. So when we run this if we put hiro image pattern print out the image is captured and the textbox comes in front of the image. Are you a smart Dotnet Developer? As you are using Microsoft Visual Studio you have proved you already a smart person. Most of the time we are doing lot of hard work to execute a project. If we see our back so we observe that we write thousand of the lines for a project (without actual logic). Sometimes a minor project can take number of days to complete. When you think about a project most of the time we have to write same line of code except the core logic. But again we have to write whole bunch of lines for the project and put lot of efforts from our side. I realized that sometime I am only hard working programmer not smart programmer while I have many options provided by Microsoft to make myself a smart work. Although I tried many times to be smart programmer as you have seen in my previous articles like database utility, three tier architecture code generator, Macros code generator etc. Here I want to share a small utility provided by Microsoft visual studio which will be a step towards making our self smart. Although this topic needs to be introduce in the same series of code generator but I am really sorry, I missed this utility at that time. Recently one of my friends asked me this question so I thought this should be share with every one because we are a team. I know some of you aware of this utility, some of you using this but it is for those friends who really wants to improve and not aware of this. The utility function is “Snippets “. Are you surprised? , I don’t think so. A snippet is a utility provided by Visual studio which is helpful in making us smart programmer. We can access the Snippets by using Ctrl + K, ctrl + X key. When you press this in visual studio you will get the list of existing snippets codes existing is visual studio. We just need to select particular code which we required and change small variable declaration and bang, we will find we write a complete code in few minutes. Great fig (2) shows we created bunch of lines for accessing crystal report by just simple clicks one more great thing is you don’t need to add reference in your code for require DLL the snippet automatically handle that. We can create our own snippets and use them. For this we have to create a XML and whose structure is as follows. I hope it would be helpful topic enjoy smartness. I urge you to share more utility which make us smart programmer. which are in the folder. reader exe with /h/p option which print all the PDF one by one. How to check your SQL Server Performance using new Utility Performance Dashboard Reports ? I know after reading the post title you are very excited to know more, even I was excited too to know more for this topic which I like very much. Microsoft Introduced Performance Dashboard Utility reports which help us in finding the cause of low performance of our SQL Server Database. 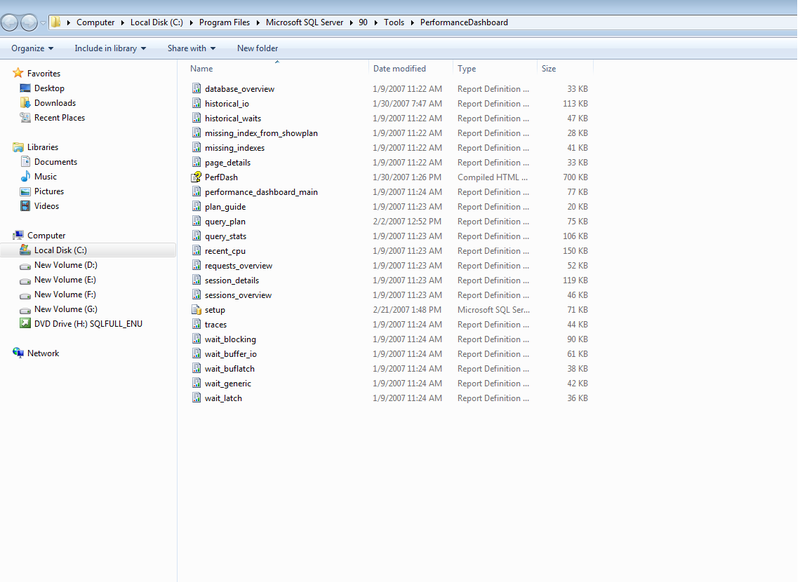 Now when you open this folder you will get many RDL files. Next question is how to use it so here we go. 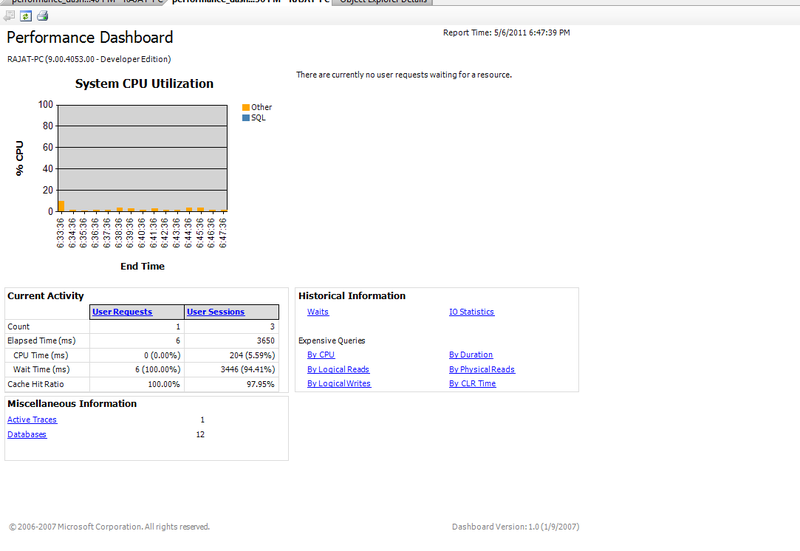 Great it means you are able to see performance dashboard report. 3) Below this we have miscellaneous information which will give basic information like number of database currently on server, active trace etc. 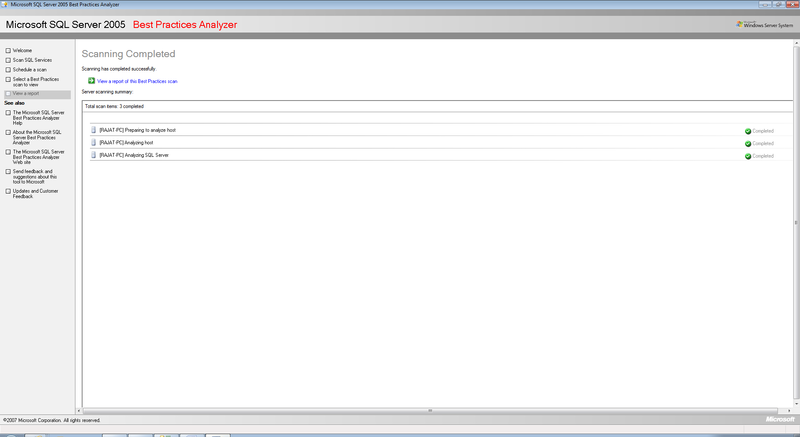 6) Expensive SQL report with different parameters like BY CPU, BY Duration, BY Logical Reads, BY Logical Writes etc. Checks out there are many more feature reports. So with these different reports we can find where we are lacking. Where is the problem? My personal feeling is the utility is good to finding the performance counter but it will not provide any suggestion and solution to improve performance. Just download and enjoy the performance dashboard. Have fun with reports in weekends: D.
We always heard that we should adopt Best Practices in SQL Server and most of the time we tried our best to adopt best practices in our work but the problem is who will analyze the best practices which we did for our database ,SQL Server. Hmm, that’s the point my dear friends but don’t worry on this part also because Microsoft introduce BPA (Best Practice Analyzer). I tried this tool recently it is easy to use. 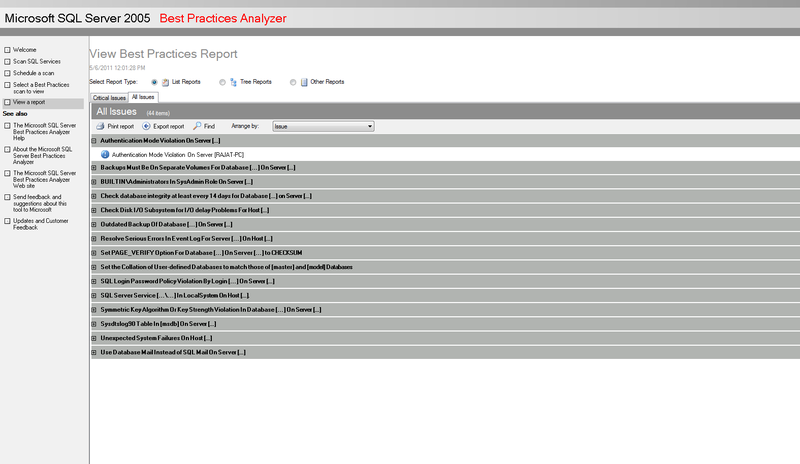 It scans your database, SQL SERVER and provides you the best way to adopt Best Practices with your current structure. 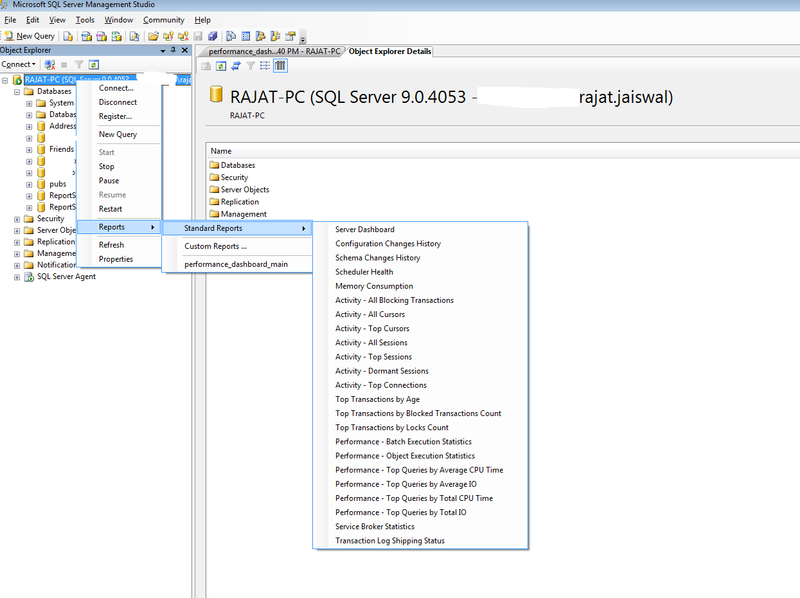 After install this BPA utility you can easily scan your SQL SERVER, Databases with this. The BPA will provide you report of scan. The scan report will give you idea about what is missing, what need to do? 1) Backup is latest or is it out dated? 2) Database having any anomalies. 3) Database integrity check required or not? Although some of the warning in the above list which we can ignore according to our business need. 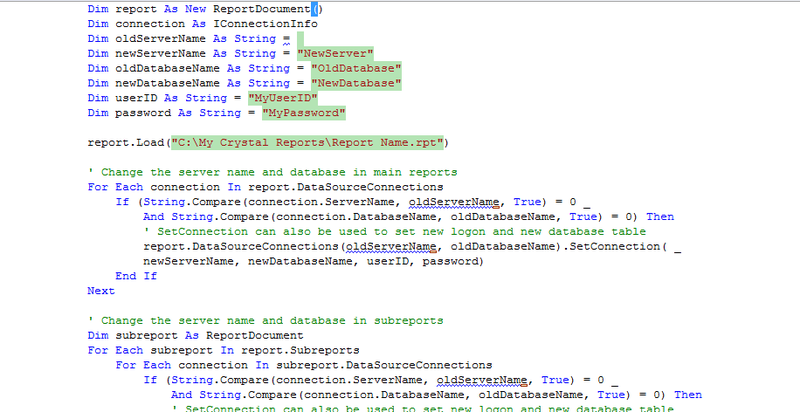 And many more issues to make SQL Server database robust just check below report snap. Best practices. So why you people waiting just download, install and use. Make your database robust with best practices.